After some aggressive driving early in this 2019 season from Ricky Stenhouse Jr. — including his typical superspeedway daring in the Daytona 500 and a run-in with Erik Jones in Las Vegas — fellow drivers now take note of where the No. 17 Roush Fenway Racing Ford is on the track at all times. Kurt Busch remarked as such in a tweet Monday evening. But Stenhouse Jr. remembers some things differently. Specifically, a Daytona 500 wreck when it appeared Busch’s No. 1 Chip Ganassi Racing Chevrolet was hit in the left rear by Stenhouse’s No. 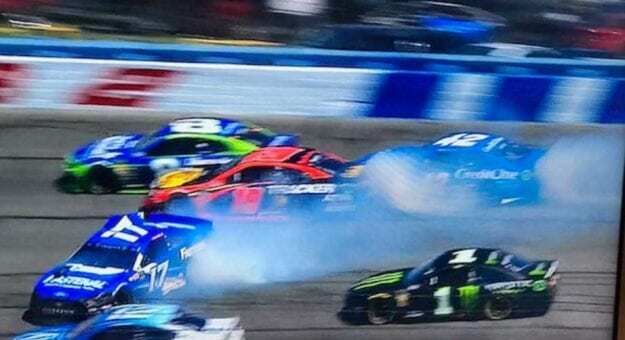 17, causing a six-car wreck on Lap 51 — but Stenhouse insisted that he didn’t touch Busch with his car. That one was all Busch, Stenhouse tweeted. DEBATE: Is Stenhouse too aggressive? Perhaps the score can be settled this weekend at Martinsville Speedway, the first short-track race of the year.